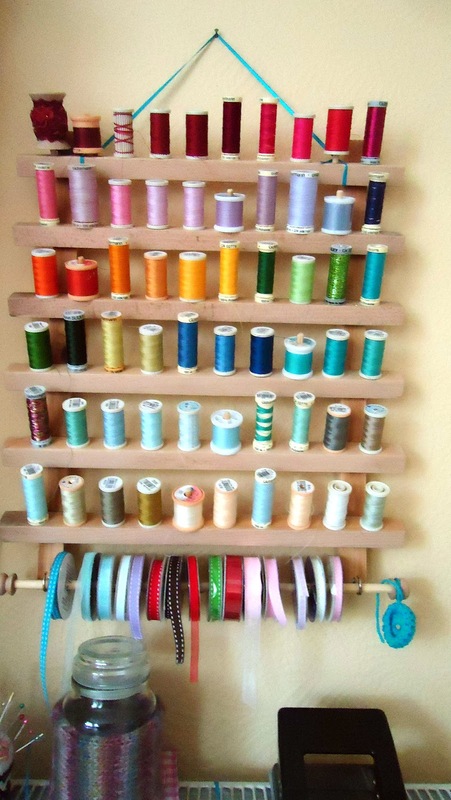 So, I have given my sewing space a little bit of a tidy up so that you can all come and have a look around. Please do come in. Having a dedicated sewing space is still relatively new for me. For most of the time I have owned a sewing machine it has lived in a variety of cupboards, wardrobes and hidey-holes and setting it up for action was a bit of a pain. 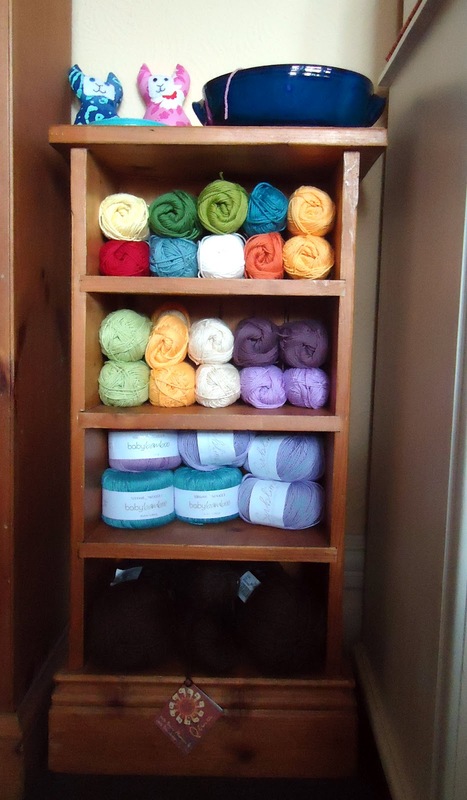 When I first started sewing more regularly, I set up a small desk in our attic room but I quickly outgrew the space. Much as I enjoyed the light and the peace, it was a little awkward negotiating a ladder several times a day and bumps on the head were a frequent hazard. Very kindly, the other Magpies agreed that I could move my paraphernalia into our dining room, which is our larger reception room. We have a cosy living room at the back of the house. When I first set up in here I brought my little attic desk downstairs with me, along with some more ad hoc storage. It worked fairly well but there wasn't enough storage and I frequently spilled over onto the dining table itself, which meant lots of dinners eaten at the tiny kitchen table. Apart from the desk area, there were still a large amount of supplies, stock and craft books to be housed. For a while, the back wall of the dining room looked like this. Whilst the madness of creating stock for the (many) craft fairs I participated in last Autumn/Winter was going on, I didn't have time to organise the space, and to be honest it was driving me a little bit bonkers. Mr Magpie will testify that my housewifely skills are not award-winning by any means, but I do have to have a tidy space to work in or I can't settle properly. While I was creating stock I kept jamming stuff in anywhere I could squeeze it, but in the back of my mind I began to put together a wish list to get the space working for me better. Top of the list was a bigger desk that would run along the length of the wall. The desk I had was from Ikea, so I was able to re-use the legs of my small desk. I also added the set of drawers I can be seen putting together here. The drawers are brilliant; they have swallowed much more of my supplies than I thought they would and as someone who has only recently had a new kitchen and is used to elderly/traditional furniture, smooth gliding drawers are a complete joy! The extra room means that I can set up my little iron and board alongside the sewing machine for completely lazy sewing. And I can leave my WIP's at the end of the desk as opposed to all over the table where we eat. Did you spot my rather fantastic reel holder on the wall? It was made to my exact specifications by a very talented member of the clan and I love it. Rich makes beautiful items with wood and is in the process of creating a website of his own. When the website goes live I will let you know and you can see for yourselves. Go on then, have a nose in a couple of the drawers, I gave them a tidy for you. Well, maybe not this one, but I'm still trying to think of a way to bring this lot under control. The extra storage meant that tidying the back wall of the room was a fairly simple re-organisation job. Here's how it looks now. Much better. I know it's a bit of a squash but I couldn't resist using my old CD rack to house some of my ever-expanding collection. So that's my crafty space. I hope you enjoyed the tour. So far all the new storage is making it much easier to keep the room tidy and we get to eat surrounded by all the stitchery! Hi Jill, thanks so much for joining my little blog, I hope you enjoy reading! Gorgeous, just lovely! I'm in the process of sorting out my 'workshop' space -I may well be pinching some of your ideas, if you don't mind!